A cup of tea at this time of the afternoon is usually gratefully accepted, and one is disappointed if it is made so badly that it is not drinkable. The young lady who presides at the tea table at an afternoon reception has sometimes a difficult task if the tea is not prepar-ed with a bag (as directed on page 550), but for the unceremonious social cup of tea with the friend who drops in at this hour it is easy to have it just right. 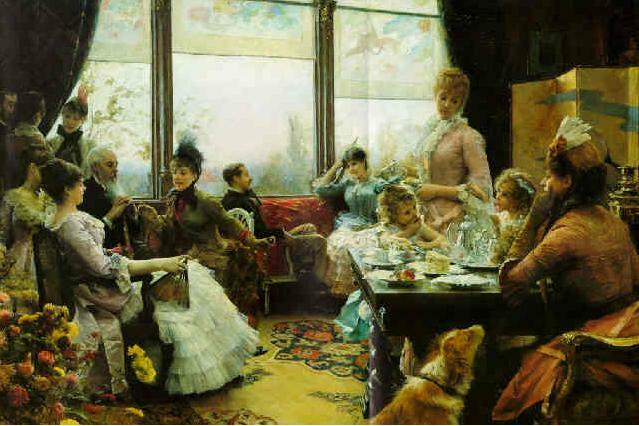 After the proper preparation of the tea (as directed on page 549), the attractiveness of the table and the delicacy of the china are the next things to be desired. Tea does not taste as well taken from a coarse, large, or heavy cup. The taste and refinement of the hostess are easily recognized in this very unceremonious, but very social, function. The cloth may be as elaborate as one wishes, but it must above all be spotless, un-wrinkled and dainty. The cups may all differ from one another, but each one should be small and thin, and the steaming kettle, which lends cheerfulness to the occasion, should be highly polished, whether it be silver, brass, or copper. A dry biscuit or a thin piece of bread and butter is usually offered with the tea. Fresh unsalted butter is preferable, but any of the fine butters may be used. The butter is spread very evenly on the loaf; the bread sliced very thin and doubled like a sandwich. It may be cut into any shape desired, such as strips, diamonds, or triangles. It is attractive stamped into circles with a biscuit-cutter of about the size of a silver dollar. Three kinds of bread may be used—white, graham, and Boston brown bread, and all may be served on the same plate. This simple dish is carried into the esthetics in some English houses, where the bread and butter is described as tasting of roses, violets, clover, or nasturtiums. The flavor is obtained by shutting the fresh butter in a tight jar with the blossoms for several hours. Butter very readily absorbs flavors and odors, indeed it is the medium used for extracting perfumes in the manu-facture of those articles. The flavored butter is spread in the ordinary way on the bread, which has been treated also to a bath of flowers. Butter sandwiches must be exceedingly thin and shapely, and have no suggestion of mussiness. They should be laid in a folded napkin to keep them fresh. Any sweet wafers may also be used, but as this is not a meal, nothing should be offered which will take away the appetite for dinner, which follows shortly afterward. Take one tablespoonful each of flour and powdered sugar and one half saltspoonful of salt. Sift them well together. Beat the white of one egg just enough to break it, and add as much of it to the flour and sugar as it will take to make a creamy batter; flavor with a few drops of almond essence. Grease the pans lightly and flour them as directed on page 464. Drop a half teaspoonful of the paste on the pan, and with a wet finger spread it into a thin round wafer. Bake it in a very moderate oven until the edges are slightly browned, then, before removing from the oven door, lift each wafer, and turn it around a stick. They stiffen very quickly, and the rolling must be done while they are hot. The water. You cannot have first-rate tea or coffee unless you use freshly-boiled water. 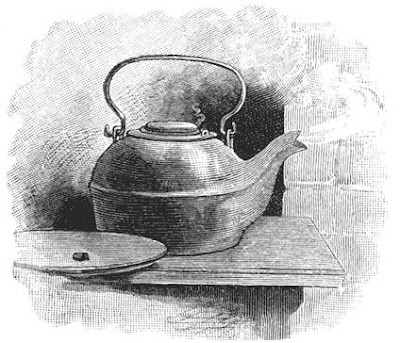 Water that has been boiled for an hour or more lacks life, and gives a dull taste to the decoction. Draw freshly filtered water and let it come to a hard boil before using. Proportions. To give the proportions of tea and water is impossible, as such different degrees of strength are demanded. One teaspoonful of tea to a pint of water, steeped five minutes, makes a weak tea. Two teaspoonfuls give the color of mahogany, if an English breakfast tea is used. Oolong tea does not color the water very much, so its strength cannot be as well judged in that way. Steeping. Tea, to be perfect, should not steep longer than five minutes; it may continue to grow stronger after that time, but the flavor is not as good, and if the leaves remain too long in the water the tea becomes bitter. The tea-bag. Where a quantity of tea is to be used, as at receptions, it is well to put the tea into a swiss muslin bag, using enough to make a very strong infusion. Place the bag in the scalded pot; add the boiling water; after five minutes remove the bag. Keep a kettle of water boiling over an alcohol flame, and use it to dilute the tea as needed. The tea will then be as good as though freshly made. If, however, the leaves are allowed to remain in the pot the tea will not be fit to use after a short time, and no matter how much it may be diluted, it will still have an astringent taste. The tea-ball. Silver balls are convenient to use where one or two cups at a time only are to be made for the friend who drops in for the afternoon cup of tea. The ball holding the tea is placed in the cup, water from the boiling kettle poured over it, and the ball removed when the water has attained the right color. Russian tea. Various preparations of tea are made by adding flavorings. Tea punch. The so-called Russian tea is made by adding sugar and a thin slice of lemon to each cup; tea punch by soaking the sugar first in rum or brandy. These, however, as well as milk, destroy the flavor of tea and change the character of the drink. Iced tea. Iced tea is a very refreshing drink in summer. It is served in glasses, with plenty of cracked ice, and should not be made very strong, or it will become clouded when the ice is added. Iced tea is improved by adding lemon. One tablespoonful of lemon-juice to a glass of tea is a good proportion. One of today's finds is "The Century Cook Book" from 1901 by Mary Ronald. A book that goes into detail about most everything that has to do with cooking and serving the meals. Ibland undrar jag om man inte gör det svårare än vad det är. Long ago my Grandmother (born in 1889) served tea in pretty China from a Silver pot on a table spread with a nice cloth ..but she was a Farmers Wife so although the china was fine the tea (to eat) was substantial.